“Underground of Enchantment” is a 3D photo exhibit featuring the beautiful magic & microbial secrets of one of the most interesting caves in the world - Lechuguilla Cave in southeastern New Mexico. Lechuguilla Cave is the deepest limestone cave (486.9m) in the USA & fifth longest cave in the world (128miles/206km). The cave holds a spectacular but fragile ecosystem which was cut off from the surface until 1986. To protect this system, entry into Lechuguilla is restricted to exploration & science. The exhibit will feature 3D photography & image presentations by David De Roest, Daniel Chailloux, Peter & Ann Bosted & Michel Renda, all remarkable photographers & outstanding cavers from Belgium, France & the United States. Gosia Allison-Kosior, originally from Poland but in love with the surface & underground of the Land of Enchantment since 1995, is curating this important look at one of New Mexico’s best kept secrets. “Underground of Enchantment” can be viewed from May 7th, 2011 throughout the summer at the Carlsbad Museum & Art Center. 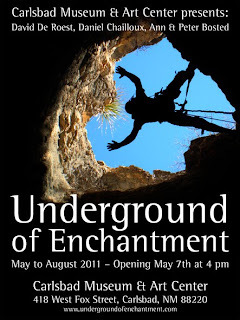 After August 2011 “Underground of Enchantment” will travel around New Mexico, Colorado & West Texas for 10 months. Then Carlsbad Caverns National Park will host it in the summer of 2012 at the Visitor Center. 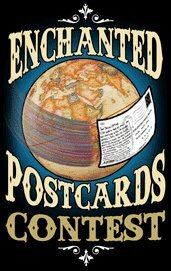 We invite all children up to age 17 around the world to participate in the Enchanted Postcard Contest. Create a 4 x 6 inch (10.5 x 15 cm) postcard with your favorite medium and technique. Try drawing, painting, colalge, charcoal, rubber stamping, or abstract art, for example. The front side of the postcard must contain your artwork. The back side of the postcard must include the following: title of the artwork, artist's name, age and full address, including country. All postcards must arrive at the museum by May 2, 2011. One entry per child. All entries will become the property of the Carlsbad Museum & ARt Center and will not be returned to the artist. At least 100 contest winners will be announced at the opening reception of the Underground of Enchantment 3D Photography Exhibit. They will be posted on the Underground of Enchantment website and Facebook page. Prizes will be sent to the winners in August 2011.